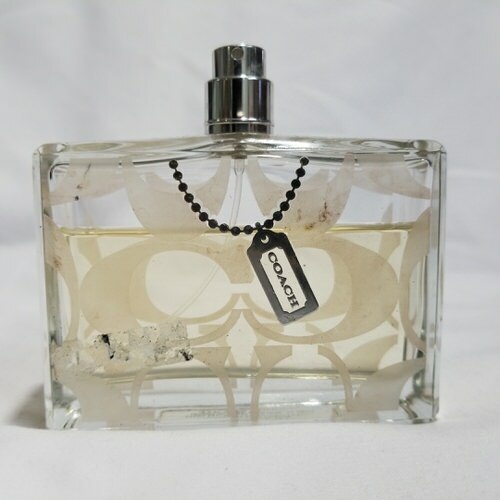 Coach Signature by Coach 3.4 oz / 100 ml Eau De Toilette spray without box 70% full for women. The first fragrance from Coach embodies the many personalities of the classic Coach woman: timeless, chic and sophisticated with it's soft floral scent. The scintillating opening notes of Signature see juicy mandarin and guava matched with the aquatic beauty of the Gant water lily. A luscious bouquet of heady jasmine and tuberose are tempered with the brightness of mimosa at the heart, while a warm and sensual dry down of vanilla, amber wood and orris create the perfect lasting impression. Notify me when "Coach Signature 3.4 oz EDT unbox 70% full for women" is re-stocked.